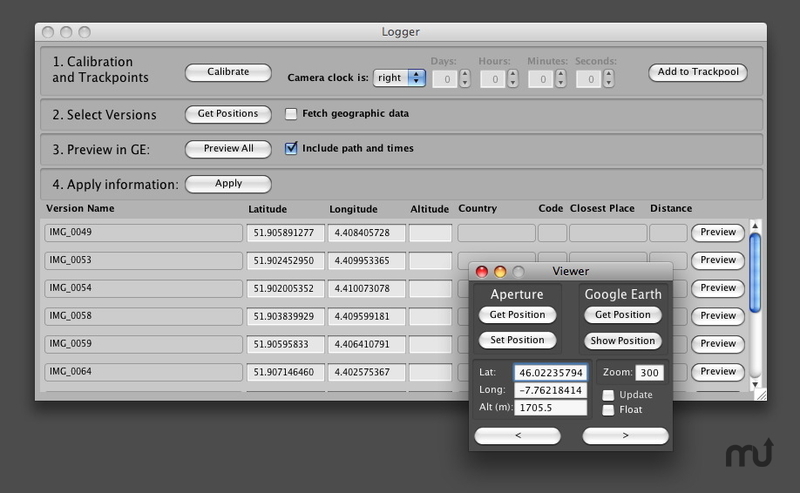 Geotagging application for Aperture and Google Earth. Is there a better alternative to GPS2Aperture Pro? Is GPS2Aperture Pro really the best app in Image Editing category? Will GPS2Aperture Pro work good on macOS 10.13.4? GPS2Aperture Pro is an easy to use geotagging application for use with Apple's Aperture and Google Earth. Visually geotag your images with the help of Google Earth. Copy GPS positions from one image to another. View individual image locations in Google Earth. Go into 'constant update' mode and watch Google Earth automatically fly from location to location as you navigate from image to image in Aperture. Geotag images from your GPS log files. Bugfix - Updating EXIF data within Aperture was failing for managed Masters on non-English installs of Aperture, due to GPS2Aperture referring to menu items by name when telling Aperture to update it's information. Feature Change - tested with Aperture 2.1.3. Feature Change - trial period extended to 30 days. Aperture 2.1 or above required for embedding of GPS data. Google Earth 4.0.2 or above. GPS2Aperture Pro needs a review. Be the first to review this app and get the discussion started! GPS2Aperture Pro needs a rating. Be the first to rate this app and get the discussion started! Visual correction for cameras set to the wrong time. Create KMZ files for Google Earth.